FA: Dave Baker & Fig. FFA pitch one: Ray Ringle. Closure information appears to be in a transition state. Please take note of the request for climbers to avoid disturbing raptors if at all possible. Self-policing our behavior is MUCH better than an outright ban! Douglas Ranger District Tel: 520.364.6816. 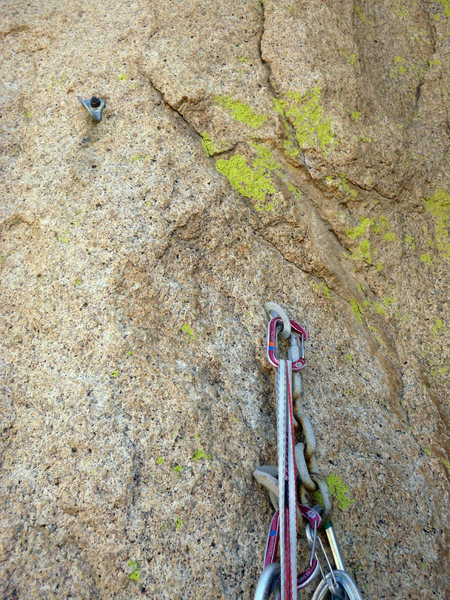 This great old-school line follows the giant chimney system on the northwest face of End Pinnacle. It was originally climbed by Dave Baker using aid on the first pitch; the first pitch was later freed by Ray Ringle. Pitch one is among the best pitches in the Stronghold. Its stemming, liebacks, and knee bars are outrageous fun and it is almost unbelievable how it climbs. The climbing remains relatively hard for the first half of pitch two until the main chimney system is gained. From here you will encounter a great diversity of classic Stronghold climbing including chimneys, bulges, corners, stems, cracks, traverses, and even an arch. The gear is sparse in places. Pitch 1 (5.11+, 90')  Amazing climbing up a groove protected by gear and bolts. Singles to #4 camalot and stoppers with an extra .5 cam is plenty of gear for this pitch. Note: If you want to do this climb but think the first pitch is too hard it can be aided. Pitch 2 (5.11, 105')  Follow bolts up and right to the main chimney (5.11). Continue up easier but sparsely protected terrain in the chimney until it is possible to traverse left behind a large column. Belay at the top of the column protected by a bolt and some gear. Pitch 3 (5.9, 100')  Move down and right into the large weakness. Chimney up to super-fun flakes, climb them, and then surmount a pointed column of rock. Continue up the chimney and crack above to a two bolt belay in an alcove. Do not clip the bolts headed up and left in the final part of the pitch, these are for a separate route. Pitch 4 (5.10, 140')  Climb the crazy-looking (but easy) chimney to a point that can be protected with #4 Camalot. Work up harder climbing to a bulge, figure out a way around it, and continue up a 5.10 groove to a roof. Traverse right under the roof to a belay stance. Pitch 5 (5.10-, 90')  Climb a corner which is harder than it looks. Traverse right and pass under a large arch to an easy stance. Place some gear on the right side of the arch to keep the rope out of the crack, then continue up a 5.8 hand/cupped hand crack to the top. The belay takes two #4 camalots. Descent: Use the same descent as the other climbs on this formation. If you are interested in a topo for this route, feel free to PM me and I will send you one. You can also get one by registering at the toofasttopos website. Doubles to #4 Camalot, stoppers. Bolts and top-anchors updated by CASA in 2018. First pitch is a Rockfellow Gem. Geir... awesome topo and photos. Thanks. The first bolt of pitch 2 broke yesterday. This bolt was about 2' above the first pitch anchor. The bolt seems like it was used mostly to avoid a factor 2 fall onto the anchor. The climbing to the next bolt is not so difficult, so the route is still doable. The leader hung on the bolt to help in the transition to leave the anchor. About four bolts up the leader fell on a new bolt at the crux. The rope straightening out broke the bolt that he had hung on moments before. I can't imagine it took more than 50lbs of outward pressure on the bolt to break it. Yikes!!!!! The bolt stud is now sitting about 1/4 inch out of the rock. The bolt broke at the first thread. The bolt had no fresh metal look where it broke. It was rusted completely through. This did not make me feel reassured on the strength of bolts in general. I think this was a 3/8" bolt with a metolius hanger, not some sketchy 1/4" bolt or an old bolt with a SMC hanger. The bolt and nut were very rusted, but I would have considered this to be a good bolt. On a lighter note this was a good climb. The rock in the middle of the climb is rather flakey. I would recommend a helmet because it is very hard to avoid knocking off these potato chip flakes. That bolt was one of the original 3/8" split shafts. It was a commonly-placed bolt in the Stronghold during the time of the FA of this route. In many cases, the Leeper hangers that were originally used were later replaced with newer hangers. Steve Grossman reported at the Granitica Festival in March 2014 that some of these aged bolts are prone to failure in a fashion similar to what you are describing. I and others are working on replacing these bolts; until they are swapped out exercise caution when using them. It sounds like the upper bolt in this picture is the one that broke. Glad you all are ok Climberz! Have you guys ever broke a bolt? This really took me buy surprise. The metolious hanger is usually a happy sight. The two old rusted bolts were the original anchor. The newer bolt and chain was added in order to make an easy lower off from the first pitch; this was done by the same person who swapped the Metolius rap hanger on to the remaining old bolt. Fortunately, failures of the old 3/8" split shafts have been rare to this point. Still, they will be swapped out as quickly as possible.